Breakout Stock Trading...is that like a "Get Out Of Jail Free" card?..Well, not quite. An escape, often with the use of force. An instance of surpassing any previous achievement. In terms of trading breakout stocks in the stock market, that definition also holds true. The theory of breakout trading is that price momentum will continue to carry the stock far enough beyond the breakout point for the trader to be able to seize a profit. Let me give you an example. Take a look at the Stock Chart below. At Pt. 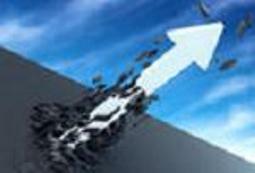 #1 in early February, the share price hit a new high of about $46.80. From that point on until March, the share price went down and bottomed at about $34.00. At Pt. #2, the share price "Breaks-Out" past over its previous high of $46.80. Pt. #3 shows that over 5 million shares of that stock traded on the day of the break-out, which is well over it's average share trading volume of just under 2 million shares a day...a very healthy sign! 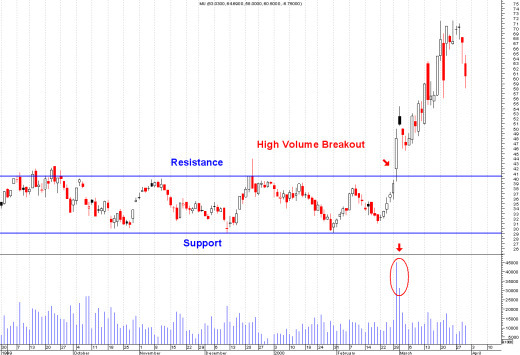 Volume plays a crucial role in choosing breakout trades. 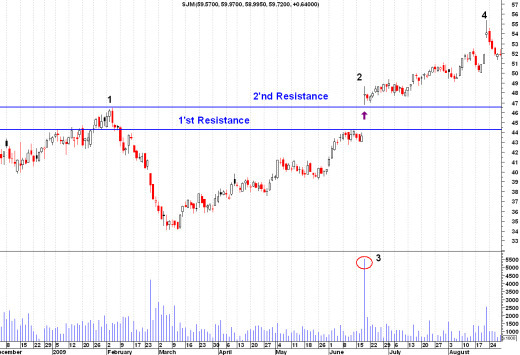 A trader should see increasing volume along with the breakout in order to confirm momentum before taking a position. It is important to note that a volume spike at the breakout, followed by a rapid decrease in volume often means that the breakout is weak and vulnerable to failure. Such breakouts should be avoided. The share price rose and in mid-August, reaches a new high of over $55.00. This is a classic example of exactly what a Break-Out trade is all about. This strategy is also associated with Momentum Trading. This chart pattern is known as the "Cup and Handle" formation. Trading breakout stocks was made famous, by William J. O'neil. In his classic book How To Make Money In Stocks: A winning System In Good Times and Bad, Bill O'Neil outlines step-by-step on how to find and breakout trade the best Growth Stocks. In his book, Bill O'neil calls his breakout trading system "CANSLIM". Each letter in the word C-A-N-S-L-I-M stands for one of the seven chief characteristics of great winning Growth Stocks at their early developing stages, just before they break-out and make huge profits for their shareholders. M = Market Direction: What is the overall Stock Market doing? The reason breakouts are such an important stock trading strategy is because these setups are the starting point for future volatility increases and large price swings. In many circumstances, breakouts are the starting point for major price trends and huge profits! Breakout trading happens to be my trading system of choice. Specifically, the stock trading system I personally use, is the Pitbull Investor System, developed by a fellow named Henry Ford (no, not the Car dude). The The Pitbull Investor Trading Strategy is based upon William J. O'neils breakout CANSLIM system. This breakout trading system, and Stock Screener, does all the pre-scanning and filtering work for you. Every evening after the stock market has closed, you can log-in and all the stocks meeting the breakout trading criteria, are made available for you. This stock system takes the guesswork out of finding good candidates that are poised to take off. Utilizing these selections in conjunction with Pitbull's Money Management, Stop Loss and Exit strategies, has produced astounding returns time and time again in all market conditions. Proven Techniques For Finding Winning Stocks! This Book Has Influenced Generations of Investors! Is there a specific Breakout Stock Trading Strategy or Technique that you use, that is not described on this page? Here is your opportunity to share your Breakout Trading expertise and technique, to help and coach other newbie Stock Market Traders become more proficient and confident on their journey to Stock Trading Success and Profitability! Return from "Breakout Stock Trading" to "Stock Trading Systems"
Return from "Breakout Stock-Trading" to the Home Page: "Stock Market For Beginners"